Today two books arrived through the post (neither from Amazon, by the way) – and that was lovely. But still there is nothing like a real live second-hand or antiquarian book shop to get my pulse racing. I visited two splendid ones earlier this week. 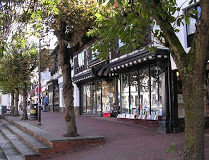 One was the East Grinstead Bookshop, new to me, which I visited with my friends, Carol and Peter, and where I picked up a couple of Agatha Christie novels that I don’t happen to have (Towards Zero, Death on the Nile). The shop stocks new books and a fine range of cards, too. There are also refreshments and I had Darjeeling tea which came with a real teapot and a china cup. Heaven. What could be more civilised? 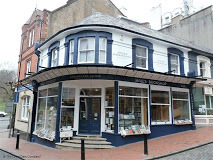 The other bookshop was Hall’s, which has become an institution in Tunbridge Wells and which I’ve visited a number of times. I was hoping to find an inexpensive present to take home for my husband. I didn’t spot the perfect thing until I wandered down into the basement and found spread out on a table an attractive series of hardbacks from the 1940s called Britain in Pictures. 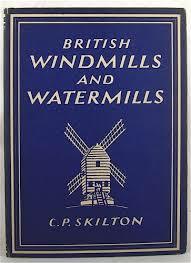 Sorting through them I discovered British Windmills and Watermills by C. P. Skilton. We live in a watermill, so it was perfect – and only £4.50 for a copy in excellent condition. That kind of serendipity is the joy of second-hand bookshops. Long may they continue to hold their own against on-line buying. There is nothing like them. Lovely – and you live in a watermill??!! Wow! Yes, and on a sunny day it couldn’t be lovelier here in the Peak district. However the endless grey winter days are tedious and I do often escape for a day in London.